Spring is in the air, and as I hike and bike the trails in southeast Michigan I find myself excited to be immersed in the lovely chorus of spring peepers and tree frogs as they prepare for this year’s breeding season. This also means it won’t be long until it is amphibian breeding season at the Detroit Zoo! Each year, the veterinary team works closely with our amphibian staff to provide support for our amphibian breeding programs. Our curators and keepers set up special breeding areas and adjust the temperature, light cycles, humidity and water access to simulate conditions in the wild and encourage natural breeding. They even set up simulated rainfall and play tape-recorded sounds of breeding calls collected from the wild. Even with all of this, some of our endangered amphibians need a little more help to breed successfully. At the Detroit Zoo, we have over a decade of experience administering special hormones to Wyoming toads and Puerto Rican crested toads to help with breeding. We have been very successful with these programs; two years ago the amphibian staff sent 3,914 Wyoming toad tadpoles to Wyoming and last year they sent 22,571 Puerto Rican crested toad tadpoles to Puerto Rico for release into their native habitat. This is important work and we are proud to be able to help. As zoo husbandry staff and amphibian reproductive experts have gained expertise, it has become clear that not all amphibians respond the same way to changes in their environment and established hormone protocols. 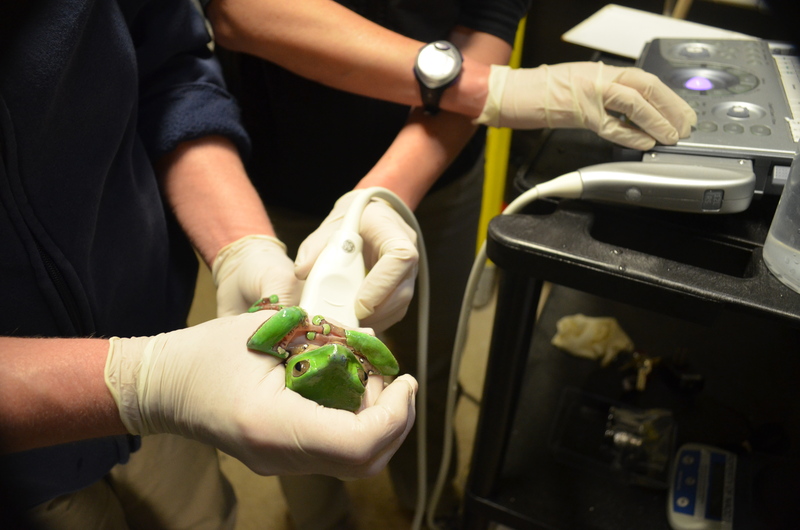 Two years ago, we purchased a high frequency ultrasound probe, and we have found that we can monitor the appearance of the ovaries and follicles as they develop and mature within female frogs and toads. This provides a very powerful tool for understanding the impact of the husbandry and hormone treatments that we apply, and will allow us to establish assisted reproduction methods for other endangered species. This season we have some exciting things planned, and have started the early work to check the females we are hoping to breed. Last week, we performed ultrasound exams on our three female giant waxy tree frogs, and were able to see that they are all developing large, follicle-filled ovaries. Based on the appearance of the follicles, we think that they will be ready to breed in the next few weeks to a month. 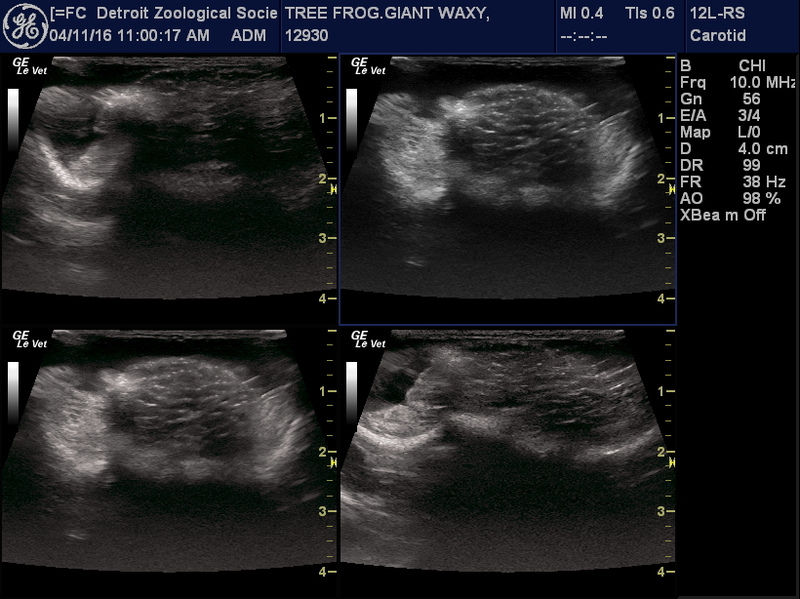 This week, we will be conducting ultrasound exams on our endangered Mississippi gopher frog females. Once we see their degree of follicle development, we’ll be able to plan a hormone and husbandry strategy for this year’s breeding season. Hopefully we will have exciting news to share in the coming months! April is an important time for the Detroit Zoological Society’s amphibian conservation programs. Three of the four animals we work with at the National Amphibian Conservation Center (NACC) that are a part of Species Survival Plans (SSP) are preparing to take part in precisely planned and scheduled breeding events. The outcome is the release of captive-born offspring into the wild to aid in the increase of their populations. First up for the season is the Puerto Rican crested toad, Peltophryne lemur. The PRC toad, as we like to call them, has been part of a well-managed SSP since 1984. Habitat loss and competition from the invasive cane or marine toad (Rhinella marina) are believed to have been primary causes for the toad’s decline. 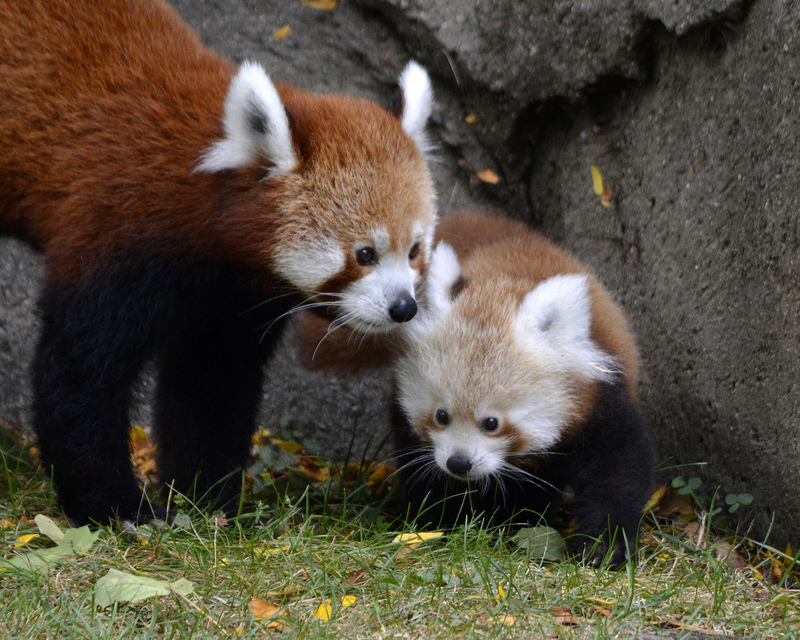 Listed as critically endangered by the International Union of the Conservation of Nature (IUCN), collaborative efforts by the Associations of Zoos and Aquariums, U.S. Fish and Wildlife Service and the Puerto Rico Department of Natural and Environmental Resources have aided the recovery of this toad in the wild. More than 300,000 captive-bred tadpoles produced by 20 zoos have been released to the wild since 1982. 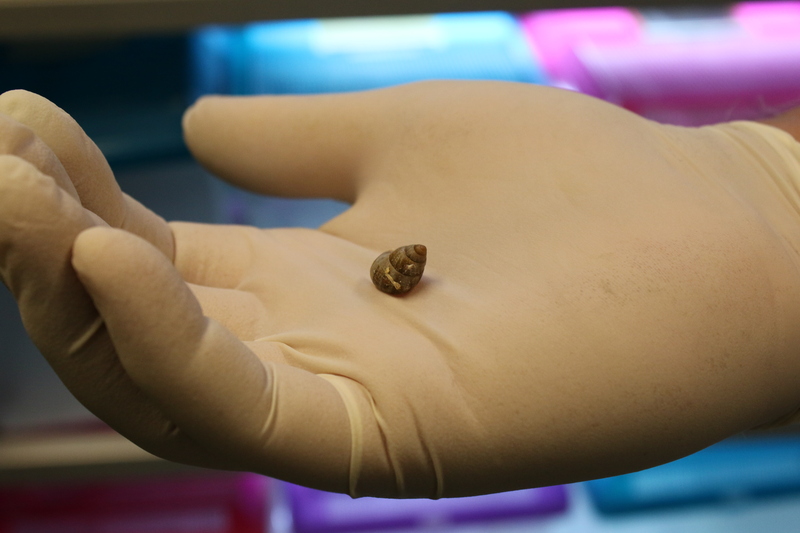 Since the year 2000, the Detroit Zoological Society has produced more than 45,000 tadpoles for this program. In 2015, three clutches of eggs laid produced 22,571 tadpoles for release – the largest amount the Detroit Zoo had ever sent. Ongoing research and the creation and protection of pond habitats have also assisted in the recovery of this toad in its natural habitat. You may be wondering what it takes to produce thousands of tadpoles from toads half the size of the palm of your hand. The breeding season starts with the assignment of four breeding pairs from the SSP. Each toad in captivity is identified and tracked using a studbook. Specialized software chooses pairs of toads that will produce the most genetically diverse offspring. 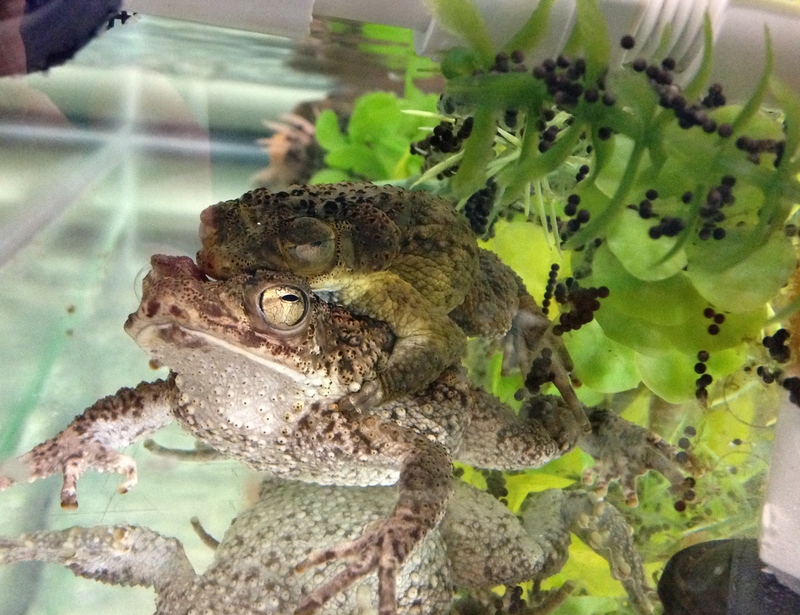 By mid-March, we know who these eight toads are and we can begin preparing them for breeding. Each toad must be easily identifiable – if you think all toads look alike you’ll be surprised to know that wart patterns and throat markings are very unique, although reading glasses are sometimes needed to make the proper ID. Toads are conditioned by slightly cooling and drying their environments out for a month-long period. A thermostat-controlled refrigeration unit keeps the toads cooled precisely at 66 degrees Fahrenheit. While the toads are “sleeping”, their primary zookeeper works diligently on preparing the breeding tanks where the pairs will breed and the eggs will develop. At this same time, veterinarians prepare a schedule of specialized breeding hormones that will further assist in ensuring that eggs are laid and fertilization happens at the right moment. Upon their exit from cooling, they return to normal husbandry to warm up and eat for a few days. 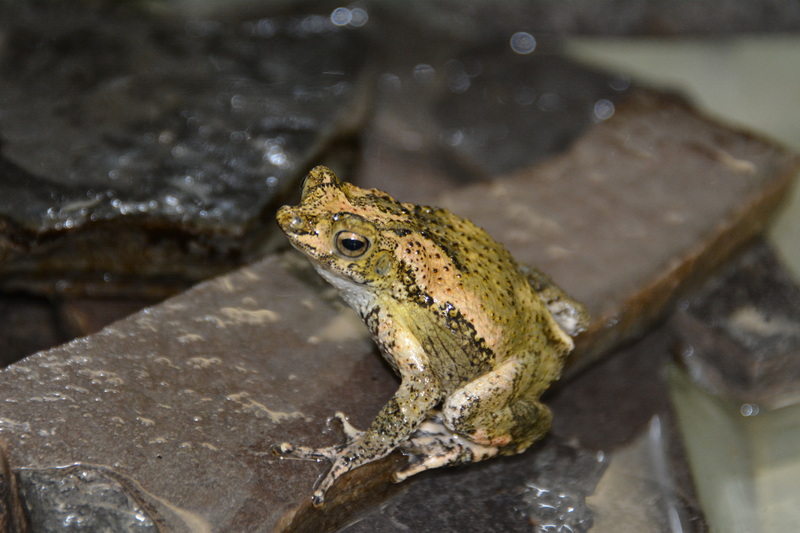 Breeding calls of male toads are played to encourage breeding behaviors. Males are first to go into the breeding tanks, followed hours later by the females. If all the preparation works, pairs of toads will be in amplexus – which happens when a male is positioned on top of a female and he squeezes her to encourage egg-laying – before we leave for the evening, followed by a morning of tanks full of eggs. It takes two to three days for eggs to hatch and another couple of days for tadpoles to begin swimming around and actively eating. Tadpoles can be some of the hungriest creatures you will ever encounter. Keepers spend the next 10 days keeping them fully fed by offering them algae pellets, powdered diets and romaine lettuce sometimes three times a day. At the same time, all those foraging tadpoles create a lot of waste, so keepers spend the rest of their time keeping their water clean with frequent water changes. During all of this, we keep a very important date in the backs of our minds – the last big event in our PRC toad breeding season. Any facility that breeds the PRC toad needs to ship them to Puerto Rico for release on the same date. The release of the tadpoles is timed with the season in which the tads would grow and develop the best in the wild. Tadpoles also need to be shipped at a certain age, before they get too big and begin to develop appendages. 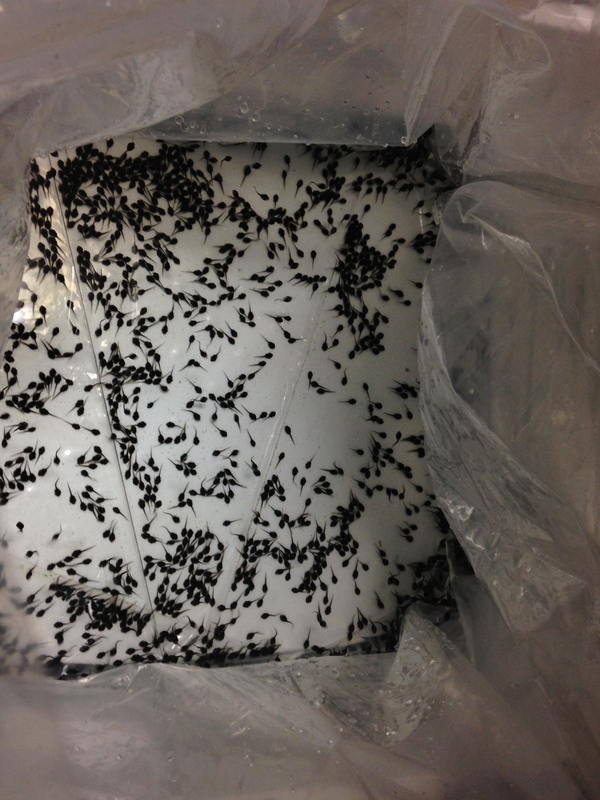 Amphibian staff can spend well over 24 hours collectively counting and packing the tadpoles into Styrofoam-protected shipping boxes. Heavy-duty fish shipping bags are used, doubled up and filled with oxygen to keep tadpoles healthy and safe on their trip to Puerto Rico. Approximately 24 hours later, they will reach their new home in a pond located in a well-protected forest in Puerto Rico. As they develop and grow, they will add to the wild population and one day, hopefully, participate in creating many more thousands of tadpoles! Rebecca Johnson is the associate curator of amphibians for the Detroit Zoological Society. We’re off to Peru for the 24th year of Adopt-A-School, a program that empowers the citizens of the Amazon rainforest to conserve and protect this globally vital ecosystem. For this journey, I am joined by fellow Detroit Zoological Society Education Specialist Ben Connor Barrie and 20 volunteers from the U.S., Canada, and as far as Australia. We will be making deliveries of school supplies to communities along the Amazon and Napo rivers. An average day begins with us packing the four “rapidos”, or fast boats, with school supplies. The volunteer team splits up into small groups and each heads out in a different direction to deliver the supplies. The children often come running to the riverbanks to greet us while adults play traditional Amazonian music on drums and flutes. Once the school supplies are moved into the schools, we begin the ceremonies with speeches, dances and more music. During one of these deliveries, I was lucky to return to a community that is very special to me. 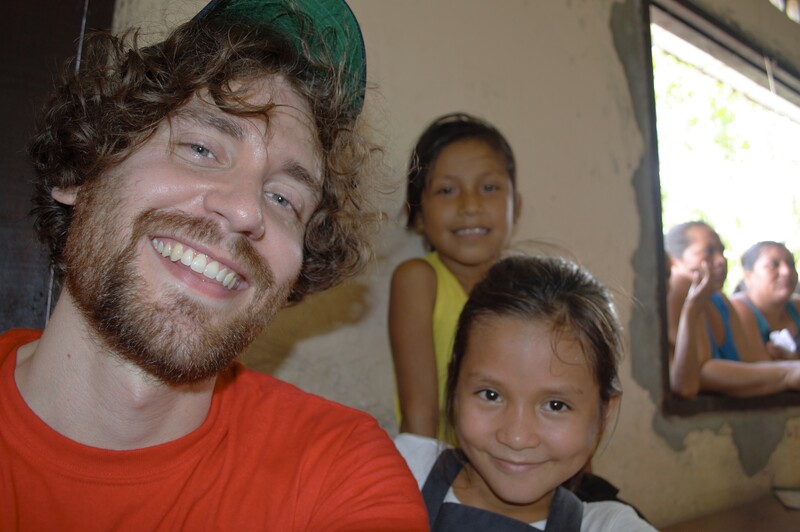 Pucallpa is home to many students I’ve become attached to, as it was the first location I traveled to on a service project three years ago. 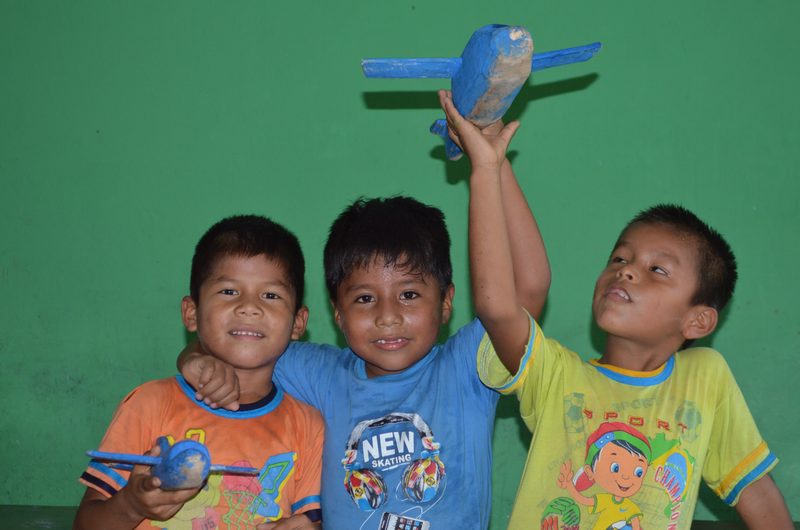 During my last visit to Pucallpa, I had some down time after program evaluations and took up with a few elementary-aged boys who were playing with their balsa wood airplanes. We zoomed around making plane noises through the school and into the schoolyards. One young boy remembered this and wanted me to do it again. 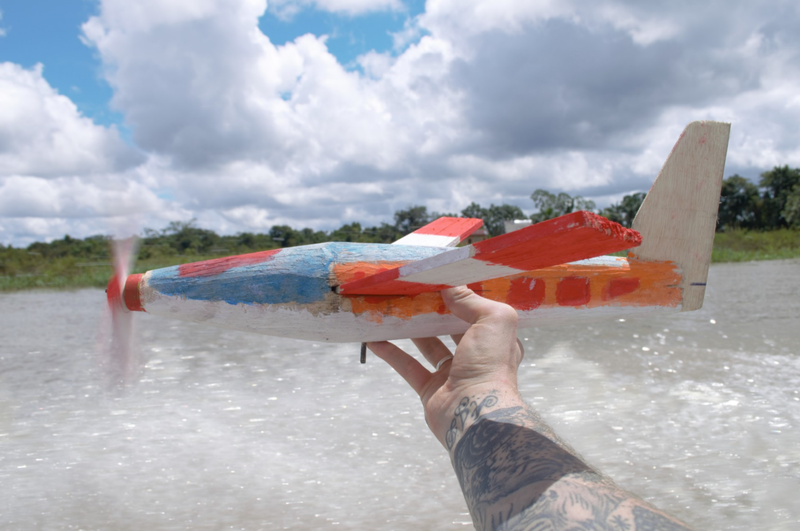 He disappeared for a few moments before returning with one of his balsa wood airplanes. He handed it to me and said it was a gift for me. This was by far one of the most special gifts I have ever received from anyone, as it was truly given from the heart. The global importance of this region cannot be stated enough. It is home to a massive variety of life and produces much of the world’s oxygen. The people who call this region of the world home are crucial partners in conserving the Amazon rainforest. 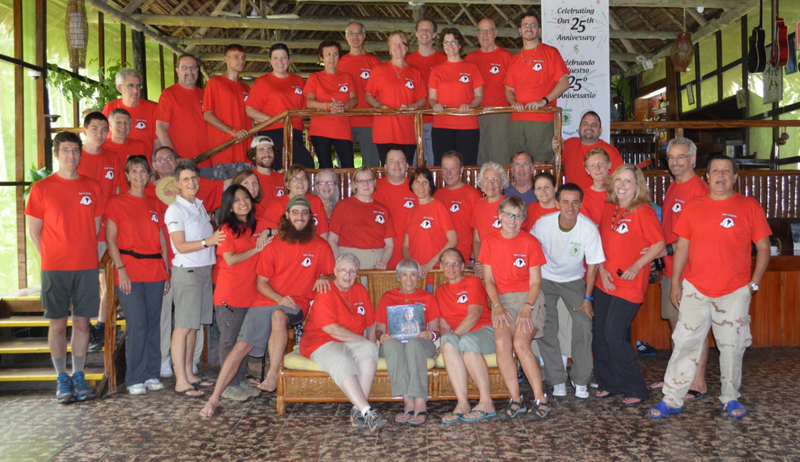 This international collaboration is preserving the rainforest, one child at a time. For more information on Adopt-A-School donations and volunteer opportunities, please visit http://detroitzoo.org/support/give/adopt-a-school. Let’s focus our attention on the smallest residents living at the Detroit Zoo: amphibians. No other class of vertebrates has the ability to adapt and evolve as quickly in our ever-changing planet as amphibians. They have used every reproductive strategy and developed life stages influenced by environmental factors; they can be colorful, camouflaged and cryptic, regenerate limbs, and have been on Earth for the last 200 million years. Currently, amphibians are the most threatened group of animals in the world with 40 percent of all species at risk. This crisis is considered the greatest extinction event in history; it’s also the Earth’s sixth mass biological extinction. While previous mass extinctions have been driven by natural planetary transformations or catastrophic asteroid strikes, the current die-off can be associated directly with human activity. This epoch started when human activities began having a significant impact on the Earth’s ecosystems. The Detroit Zoological Society (DZS) participates in Global Assessments, which provide a comprehensive inventory of the conservation status of biological species as well as a critical dataset for evaluating the health of key elements of biodiversity and identifying threats to their survival. Newly described species emerge yet extinctions are occurring at an even faster rate. Climate change is the most dramatic cause of declines, and it affects amphibians both directly and indirectly, as reproduction is dependent on temperatures and seasonal transitions. Low pond levels expose embryos to more ultra violet (UV) light and UVB radiation is harmful to many species. The shorter periods and earlier opportunities for breeding ultimately reduce the chances of success. Amphibians are also dependent upon water, which makes them vulnerable to desecration when ponds dry too quickly. But since amphibians rely on the environment, they also are excellent storytellers. They can help us determine where pollutants are and if there is misuse of habitat. 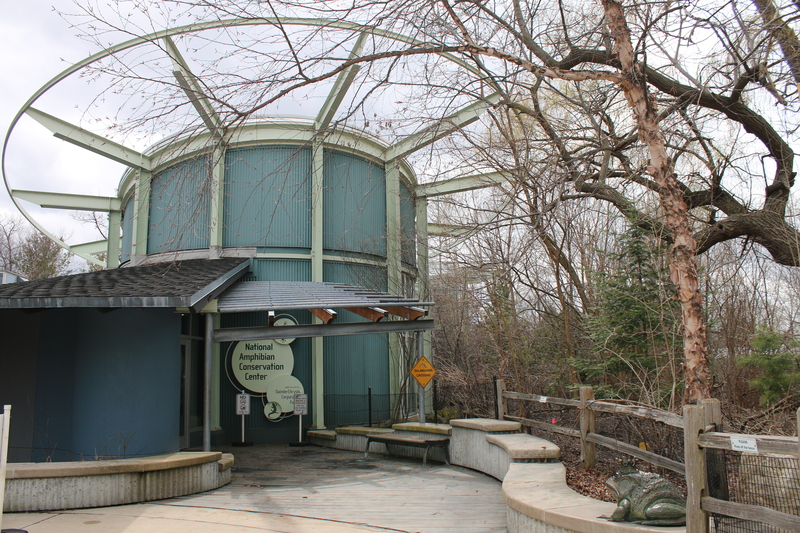 When the National Amphibian Conservation Center (NACC) opened at the Detroit Zoo in 2001, it was the first major facility dedicated entirely to conserving and exhibiting amphibians. The award-winning, state-of-the-art amphibian center is home to a spectacular diversity of frogs, toads, salamanders, newts and caecilians, many of which are the subjects of field research and part of cooperative management programs called Species Survival Plans (SSP). Amphibians selected for an SSP are generally threatened, endangered and sometimes even extinct in the wild. The DZS is actively involved in many of these programs, including for the Wyoming toad, Puerto Rican crested toad, Panamanian golden frog, crawfish frog and Mississippi gopher frog. Some amphibians bred at the Detroit Zoo have been released into the wild to boost endangered populations, and others require us maintaining a “captive assurance population” because due to factors in the wild, they cannot be released just yet. When it’s safe for these species to return to their native homes, we have a population ready to release. We have specially designed, bio-secure rooms that can hold each of these species so they won’t be exposed to other amphibians or anything else that may be harmful when they are released. In addition to maintaining our captive amphibian population and our efforts in cooperative breeding programs, DZS staff participates in several field projects and research programs, offers citizen science training and provides support for wildlife rescues, including those from the exotic pet trade. – Marcy Sieggreen is the curator of amphibians for the Detroit Zoological Society and oversees the National Amphibian Conservation Center at the Detroit Zoo.